Dr Zainal Abidin Bagir, Director of the Center for Religious and Cross-cultural Studies (CRCS), Gadjah Mada University (GMU), Yogyakarta, Indonesia. There is a universal consensus that Muslim dictatorships, supported by the west, are the root of evil. They destroy political culture, kill extra-judicially and their repression foments violence. The primary opponents of these dictators are the populist Islamists. They want to vote; except after voting they want to appoint an extra-constitutional body of clerics to strike down legislation they do not approve of. Faced with only these two options – dictators or elected theocrats – in Muslim majority countries, the usual reaction by westerners is to throw their hands up in frustration and opt for apathy or give into a militaristic pessimism. These are both uninformed reactions. They fail to take into account the future of Islamic reform, which lies with the emergence of a post-Islamist political order in the Muslim majority world. Post-Islamism is at hand because a new crop of Muslims has figured out how to reconcile liberal democracy with Islam. Upon doing so, they give up on creating religious organisations devoted to “da’wah” and move towards becoming organised as civil-political parties with platforms based on equality and pluralism. Incidentally, part of the credit for the popularity of post-Islamism goes to the theocratic Islamists. In their eagerness to merge religion with politics, they thought the result would be religion. Instead, the devout middle class realised that religion alone could not provide for their social concerns. Post-Islamism, thus, is the recognition that while religion may provide salvation in the next life, politics is what provides for welfare in this one. It is, at its barest, politics subsuming religion. Today, post-Islamist groups are at work in various Muslim majority countries, including Egypt, Turkey, Pakistan, Indonesia and Malaysia; to name a few. But then, they are faced with many obstacles and challenges. 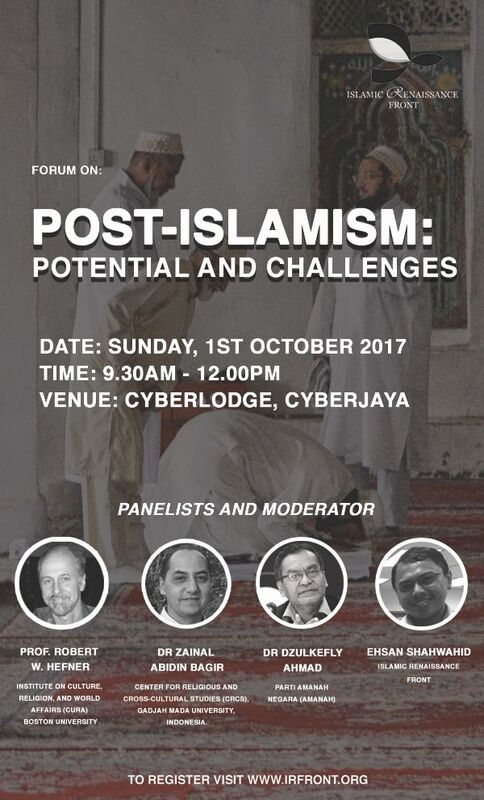 Hence, this forum is to debate and discuss about the future potentials and challenges of post-Islamism, as a probable successor of Islamism. Prof. Robert W. Hefner is professor of anthropology and director of the Institute on Culture, Religion, and World Affairs (CURA) at Boston University, where he served as associate director from 1986-2009. At CURA, he has directed the program on Islam and society since 1991; coordinated interdisciplinary educational programs on religion and world affairs; and is currently involved in research projects comparing responses to modern social change (“modernity”) in Christianity, Islam, Hinduism, and Buddhism. Hefner has conducted research on Muslim culture, politics, and education since the mid-1980s, and on the comparative sociology/anthropology of world religions for the past thirty years. He has directed some 15 major research projects, and organized 11 international conferences. Recent projects have examined shari`a law and citizenship in eight Muslim majority countries (2008-2010); the culture and politics of Muslim education (2005-2007); the prospects for and the politics of civil democratic Muslim politics (2002-2004); and social resources for civility and participation in the deeply plural societies of Malaysia, Singapore, and Indonesia (1999-2001). Hefner has authored or edited fifteen books, as well as seven major policy reports for the U.S. government and private policy foundations. Five of his books have been translated into Indonesian. During 2009-2010, Hefner serves as the elected president of the Association for Asian Studies, the largest professional association for Asian studies in the world. During 2008-2009, he was invited by Stanford University and the National University of Singapore to be the first Lee Kong Chian Fellow in Southeast Asian Studies. Hefner was also invited to be editor for the sixth volume of the forthcoming New Cambridge History of Islam, Muslims and Modernity: Society and Culture since 1800. He has also served as member of the advisory committee to two SSRC projects, the “Religious Lives of Migrant Minorities” and “Religion in International Relations”; as an advisor to a project on “religionification” in Southeast Asia at the École des Hautes Études en Sciences Sociales in Paris (2009-2010); and as an invited Senior Professor in the Summer Graduate Program on Religion, Culture, and Society at the University Centre-St. Ignatius, University of Antwerp, Belgium (2007-2009). Dr. Zainal Abidin Bagir, Ph.D. is the Director of the Center for Religious and Cross-cultural Studies (CRCS), a Master’s program at the Graduate School of Gadjah Mada University (GMU), Yogyakarta, Indonesia. He is also a member of the Board of Trustee of Indonesian Consortium for Religious Studies (ICRS-Yogya), representing GMU. In 2009, he was appointed as Indonesian Associate for UNESCO Chair in Interreligious and Intercultural Relations – Asia Pacific (associated with the Chair at Monash University, Australia). Zainal received his doctorate in the Department of History and Philosophy of Science, Indiana University. 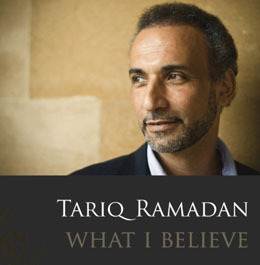 His previous education includes undergraduate in mathematics (Bandung Institute of Technology, Indonesia, 1992) and Master’s program in Islamic philosophy and science (International Institute of Islamic Thought and Civilization, ISTAC, Kuala Lumpur, 1994). He is currently the Indonesian Regional Coordinator for the Pluralism Knowledge Programme, a collaboration between four academic centers in Netherlands, India, Indonesia and Uganda. The program includes coordinating three local researches and initiating the publication of Annual Report on Religious Life in Indonesia since 2008. Recently he led a research (2008-2009) on four decades of discourse and practice of inter-religious dialogue in Indonesia. At CRCS he teaches Academic Study of Religion, Philosophy of Religion, and Religion, Science and Technology. At the Philosophy Department of GMU he teaches philosophy of science and of technology. He conducts research and writes on subjects related to religion and contemporary issues, with special attention to religion and science and to the Muslim world, and issues on the relation between religious communities.